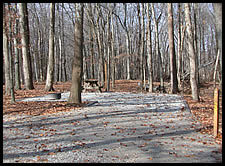 McCormick's Creek State Park has 33 primitive (Class C) camp sites. There are several (more natural) primitive campsites on the main loop of the campground road, though the majority of the primitive campsites are contained in the adjacent primitive campground. The sites contained in the primitive campground are gravel sites with wood borders. For these sites all camping units, tents, equipment and vehicles must be set-up and parked within the bordered campsite boundaries.